My friends can attest to the fact that I have way too many reminder notifications on my phone. Now I’ve been known to exaggerate, but when I say “way too many,” I truly mean WAY . TOO. MANY. Once a sweet friend tried to help me with this problem and persevered through deleting literally hundreds of reminders from my phone (shoutout to you, Allie. You’re a gem). God never forgets. I laughed and shook my head as I read these ancient reminders. Some of them made me smile. One reminded me to respond to Cori about being roommates, and she ended up being the sweetest roomie and friend I could hope for. Another one reminded me that my friend had a date that day so to check up on her, and that sweet date ended up becoming her husband. So much joy! But some of them, to be honest, I had completely forgotten about. I wasn’t sure who some of the people or what some of the situations in those reminders were, and that’s okay because we all move on and change and grow. But God always remembers. In Luke 12:6-7 Jesus questions, “Are not five sparrows sold for two pennies? Yet not one of them is forgotten by God. Indeed, the very hairs of your head are all numbered. Don’t be afraid; you are worth more than many sparrows.” In these two sentences, Jesus speaks worth and comfort into our jam-packed lives. God knows each detail. Even when we forget, he remembers. He is trustworthy, omniscient, and deserving of all our praise. I’m not enough (but that’s okay, because I was never called to be). 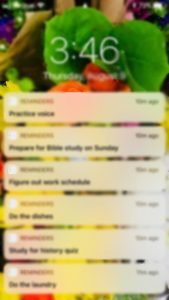 It’s ridiculous the amount of reminders I need in order to stay on top of life’s basic tasks. As I was clearing my phone, I found reminders of tests, quizzes, friends’ birthdays, random chores, work schedules, and more. I can’t remember these things on my own, and (to be honest) I sometimes forget about these things even though my phone reminds me about them! At first, that can be discouraging. I want to be self-sufficient; I want to be highly organized and on top of every element of my life. But is that what God wants? In 2nd Corinthians, Paul talks about a “thorn” God allowed him to deal with in order to keep him from pride. Paul continues to write that, “Three times I pleaded with the Lord to take it away from me. But he said to me, ‘My grace is sufficient for you, for my power is made perfect in weakness.’ Therefore I will boast all the more gladly about my weaknesses, so that Christ’s power may rest on me. That is why, for Christ’s sake, I delight in weaknesses, in insults, in hardships, in persecutions, in difficulties. For when I am weak, then I am strong” (2 Corinthians 12:8-10). God delights in taking our weak and feeble selves and making us his warriors. This might not happen in the way we expect, however. It’s not as if God comes to us and injects us with some super-ability to be on top of life. Instead, God walks with us through life and shows us his transforming mercy in the middle of our everyday routines. When we’re weak, we’re focused on Who is strong. When we think we’re the ones with strength, we deceive ourselves and turn our eyes away from our true Strength and Hope. God is consistent and faithful. I highly doubt this is the best idea, but my typical reaction when I see a reminder is to hit the “remind me later” option. And my phone always does remind me later. Sometimes I keep hitting that option until it’s ridiculously late, but still the reminder pops up. Have you ever felt like you’ve postponed obedience for so long that it’s not even important anymore? Maybe it’s been a long time since you tried to change a bad habit, or maybe you keep postponing an important conversation with God because you’re scared of the results. Whatever you’ve been “hitting snooze” on, take courage that God is faithful even when we aren’t. 2 Timothy 2:13 proclaims, “if we are faithless, he remains faithful, for he cannot disown himself.” So in the middle of your hustle and bustle, remember that God is there and he is faithful even when we aren’t. The next time you see a reminder pop up on your phone, I hope you smile and remember that God never forgets, God is enough, and God is faithful. In our own relationships, let’s strive to be the same!